Hindu statesman Rajan Zed delivered the invocation from ancient Sanskrit scriptures. After Sanskrit delivery, he then read the English interpretation of the prayer. Sanskrit is considered a sacred language in Hinduism and root language of Indo-European languages. Reciting from Brahadaranyakopanishad, Rajan Zed said: “Asato ma sad gamaya, Tamaso ma jyotir gamaya, Mrtyor mamrtam gamaya”, which he then interpreted as “Lead us from the unreal to the real, Lead us from darkness to light, and Lead us from death to immortality.” Reading from Bhagavad-Gita, he urged Representatives to keep the welfare of others always in mind. 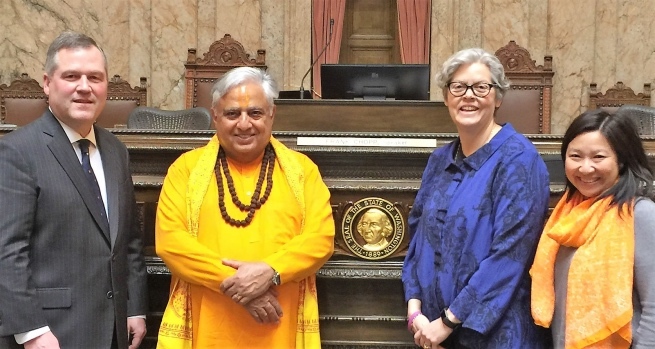 Speaker Pro Tempore John Lovick was presiding when Zed read this Hindu invocation wearing saffron colored attire, a ruddraksh mala (rosary), and traditional sandalpaste tilak (religious mark) on the forehead. With Frank Chopp as Speaker, Washington House of Representatives has 98 members. Washington, also called the 'The Evergreen State'; is known for Mount Rainier, apples, wine, higher life expectancy, extensive ferry system, etc. Jay Inslee is the Governor.